Today, the impact of technology on education is greater than ever. Yet, the debate still rages as to whether technology is good or bad for education. Many educational institutions—from K to Higher Ed—are already using tech tools and devices to enhance the learning experience for their students but there are still many that restrict the use of technology in classrooms. The real questions should be, what do students think? And what do students want? After all, they are the ones most effected by today’s teaching methods. A Wakefield Research study on the impact of tech on education (sponsored by the e-learning platform company VitalSource) garnered some eye-opening results. The survey questioned 519 students currently enrolled in college, and nearly 56 percent of them preferred to be in a digital class room rather than an in-person class. Another 74 percent said they would score better if their instructors actively used technology to teach them. The numbers don’t end there. Sixty-one percent said they would prefer if their homework was more interactive, with elements such as video. They also want to be exposed to more interactive learning, and believe learning would be more effective if they could collaborate with their teachers for instant feedback. Nearly half, 48 percent, concurred that digital collaboration would enhance teaching methods. The results speak for themselves—students want more technology in their classrooms, not less. It stands to reason, since this generation were born and raised on digital technology. They latch onto computers, laptops, and tablets pretty early in life, and seemingly can’t function without their smartphones and wearable devices. Using technology is simply second nature to them. Educators should actively leverage this natural proclivity towards technology to develop more interactive and effective teaching and learning methods. From old, bulky computers to the modern-day iPads—a lot has changed in the way technology is used in classrooms today. The use of such advanced technology is not just about shifting from the traditional format to a more modern approach. It’s about enabling students to use tech to make learning more interactive and engaging. Paper-and-pencil lessons and boring lectures are a thing of the past, and educators need to embrace the technology that is available to bring a new dimension to learning. Digital technology like interactive whiteboards, mobile devices, videoconferencing, and podcasts have entered classrooms and they have a huge impact on how, what, and where education is being delivered. Videoconferencing, for example, brings instructors from all over the globe to individual classrooms. Students can access experts and even virtually tour historical places using interactive video technology. Students are also embracing video collaboration between peers and professors alike. Video collaboration brings students together from various schools to work as a team, with teachers delivering instant feedback. These simple tech nuances bring another level to education that makes the learning process more intuitive, interactive, and effective for students. Digital technology has also succeeded in knocking down geographical and cultural boundaries, giving students a more global education that will continue to benefit them throughout their lives. There is also a cost-saving aspect to technology as well. Educational projects like Wikiversity and Wikibooks have made information available to all, for free. E-books lower the cost of education, since they can be downloaded and shared among a large number of students. This also gives students and teachers easy access to the latest, most updated information. 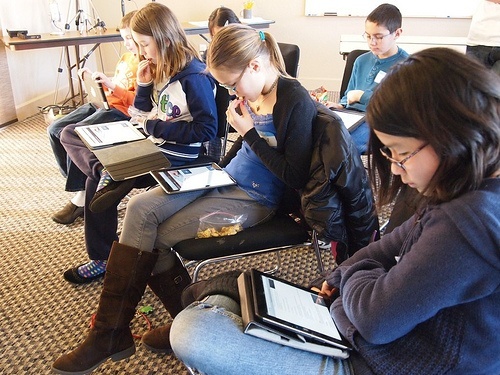 As digital natives, today’s students see technology as a fundamental part of their lives. It affects how they do everything: Socialize, shop, play, connect, and even how they learn. Because we are living in a digital world, it is crucial for educators to implement technology in their classrooms. - The world is becoming more tech dependent, so using digital technology will prepare students for their future endeavors. - Technology allows teachers and students alike to explore alternate ways of learning, and provides greater flexibility and instant feedback. - Through videoconferencing, students can interact with classmates and collaborate with peers located across various continents and time zones. Collaborating with professors located remotely is also made possible with video. - Students have technology at their fingertips, so they are more likely to be more interested in learning using their everyday, familiar tech tools. - With mobile technology, students can access the most up-to-date information faster and easier. - Technology gives students the ability to learn at their own pace and ensure they don’t miss lectures or classes. Students, along with the rest of us, are becoming more dependent on technology. It truly has changed every aspect of our lives. We owe it to today’s students to give them the right tools for the right job, to shift teaching methods to incorporate more technology in the class room, not less, and to enrich learning now and prepare them for the future. But the biggest thing we owe today’s learners? We owe it to them to listen. Listen to what they want, and go out of our way to deliver it to them.